The dark blue Royal Oak Offshore Diver, part of the new "Funky Colour" collection, customizable with interchangeable yellow or blue straps. 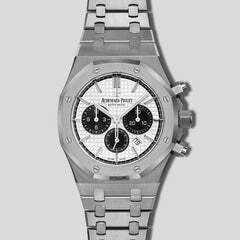 The Audemars Piguet Royal Oak is a modern day icon, a timepiece disruptor that changed watchmaking forever in 1972. The octagonal bezel, the “tapisserie” textured dial, and integrated bracelet define the world's first luxury sports watch universally recognized as a design masterpiece. In 1993, the introduction of the Royal Oak Offshore brought about additional change, introducing a compelling new twist to the iconic Royal Oak. The Offshore pushed the boundaries of watchmaking even further, offering new materials, new sizes, and sportier functionality. Selfwinding watch with dive-time measurement, hours, minutes, center seconds. 42 MM stainless steel case, glareproofed sapphire crystal and caseback, blue rubber-clad screw-locked crowns, blue dial with “Méga Tapisserie” pattern, white gold applied hour-markers and Royal Oak hands (yellow minutes hand) with luminescent coating, blue rotating inner bezel with diving scale and zone from 60 to 15 minutes in yellow, blue rubber strap (additional strap in bright yellow). 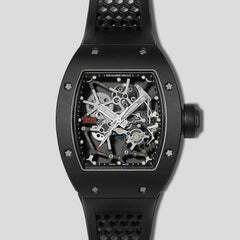 Water resistant to 300 meters with a power reserve of 60 hours.